Located close to the famous Achilleion Palace in Perama on the stunning island of Corfu, Alexandros Palace Hotel is a peaceful retreat for those craving a relaxed holiday away from the hustle and bustle of city life. With its serene location overlooking the Pontikonisi island, powder-soft sandy beaches just a stone’s throw away, huge outdoor pool, sun terrace and pool bar, Alexandros Palace Hotel offers everything you’d want on your beach getaway. you the very best in amenities and hospitality. 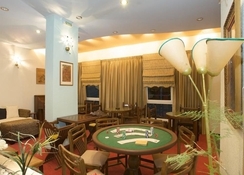 The hotel has 95 comfortable rooms furnished with all the necessary amenities. Other than that, your room comes with a balcony for you to soak some exotic views of the Ionian Sea. The hotel’s large swimming pool comes with a pool bar, so that you can enjoy cocktails under the blue skies. 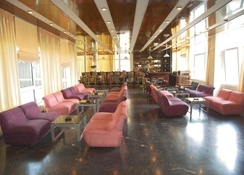 The hotel is gastronomically rich with the in-house restaurant serving an assortment of local and international dishes and with bars serving fancy cocktails. Alexandros Palace Hotel, a beautiful property in Perama is a popular choice for the tourists coming to Greece. Built about 100 metres from the golden shore, you have ample of space to bask some sun. 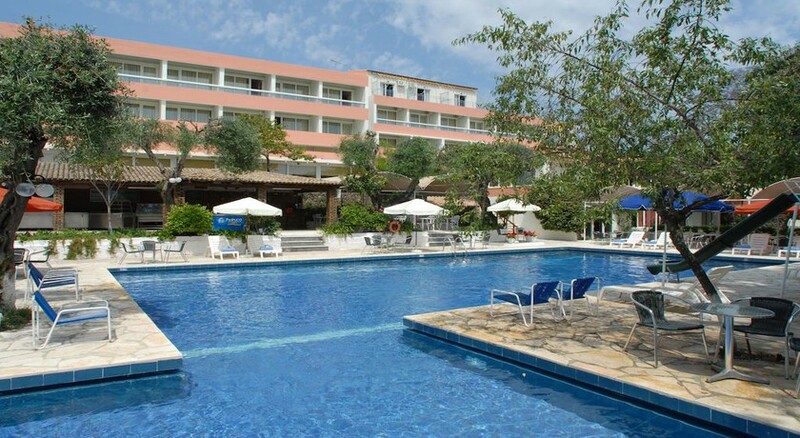 The Achilleion Palace is located close to the hotel, while the Corfu town is just 6 km away. The bus station is in close proximity too, just 50 metres from the hotel. The nearest airport is Corfu Airport, which is just a 10-minute drive from the hotel. The hotel features a total of 95 rooms, with a modern decor and private balconies offering splendid views. 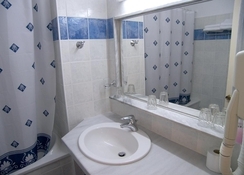 There are 3 categories of rooms: Double or Twin Room, Triple Room and Family Room. Each room is furnished with all the amenities like air conditioning, telephone, safe box, private bathroom, mini fridge, satellite TV, Wi-Fi and more. Room service is available round the clock. Dine on exquisite dishes at the Alexandros Palace Hotel’s on-site restaurant that serves everything from international to Greek cuisines. 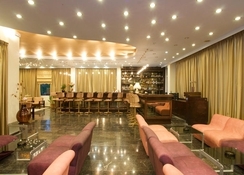 The hotel also features multiple bars, including the indoor main bar and outdoor pool bar offering a large number of drinks and refreshing cocktails to pick from. 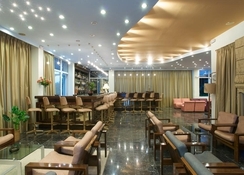 The hotel hosts an array of leisure and entertainment programmes for the guests, including a large swimming pool, a sun terrace, a pool bar, a large lobby with satellite TV and an internet corner. Outside the hotel, a stroll in the beautiful golden sands will make you feel far away from the busy tourist point in Corfu. You can lounge in the sun at the beach, just a few minutes’ away from the hotel. You can also rent a car from the hotel and visit nearby attractions such as Achillion Palace, Kaiser Bridge and Pontikonisi island. For a budget hotel this ticked all the boxes for us. It was a brilliant base for exploring the area. Hotel was a little tiered but it was clean and staff were very friendly. We woul return. Alexandros is spotlessly clean. Bedding and towels are pristine, maid service is daily. Room allocation is luck of the draw. However at the hotel you can always ask to upgrade for a fee if there is availability. Food: All meals are self service. breakfast you will find everything from continental choices to full English. However, do not expect British sausages they are not available in Greece. At lunch and dinner there is always a choice of meat, fish and in season veg. You will always find pasta with various sauces and an in season salad bar. Desserts as everywhere in Greece are quite repetitive, fruit platters with fresh seasonal fruit and Greek sweets and of course usual ice creams. Let’s say you will always find something you can eat. All inclusive drinks are the norm and there is a very drinkable white, rose and red wine on tap in the dining room along with juices and water. Just help yourself. The pool bar is also available all day for alcohol and soft drinks and teas and coffees. The hotel also has a really good car hire based in the reception area and a shop that sells a myriad of items at supermarket/ store prices. If you are bringing back cigarettes place your order on arrival to ensure you get the number of sleeves you require. In Greece prices are state controlled so you pay the same everywhere. Pool is cleaned daily and there are ample sun beds. Entertainment team organise various activities during the day and organise after dinner activities daily. For excursions just cross the road, by the bus stop and Tracy an English lady will quickly sort out the best options for you. For the blue lagoon boat trip book early as places are limited and fill very quickly. Buy bus tickets in advance from the shop to save money. lovely hotel. brilliant staff. the only thing that disappointed me was the main road where the hotel is located. We booked this last minute trip to spend some time with our niece and whilst the hotel staff were lovely and the breakfast had a good variety of choice, the food for lunch was a bit of a let down with not much on offer. We heard from others that they were being forced to eat outside the hotel as dinner wasn't that great either, so we did the same. Luckily there was a great restaurant across the road, but most of them locally had closed as all the hotels are now all inclusive. I say if you want good food go B&B and eat out. Friendly helpful staff good choice of food well cooked. Easy access to bus for all destinations. If you're after a base, this hotel is perfect. Rooms are adequate, easy to get into town. Food is edible but nothing to write home about. There's plenty of places nearby to eat. Personally I spend very little time in a hotel, when I holiday I like to see the area. Hotel was really nice and staff welcoming.